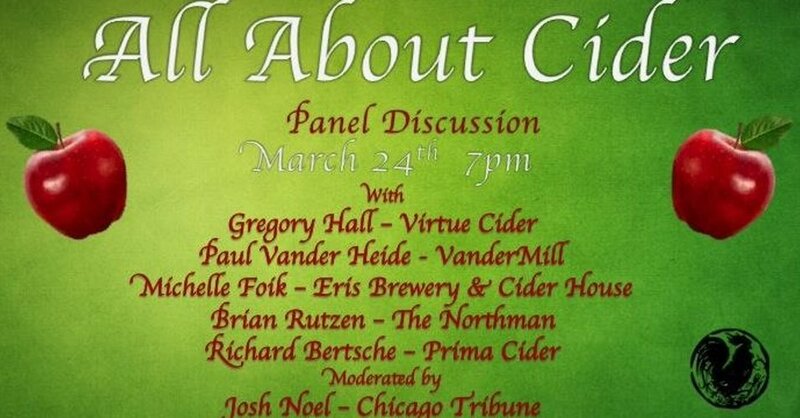 Gregory Hall – Founder Virtue Cider, Goose Island Beer Co.
Brian Rutzen – Cider Director at cider-focused bar The Northman. -Apple Varieties. Purposes for using specific varieties. -General process of making cider. How it’s different from other beverages (like beer). -Barrel-Aging program and it’s impact on flavor. -Other ingredients and their impact/purpose (fruits, nuts, etc). -Market Growth/Expectations for Cider in the future. -And whatever else happens to come up! This is a FREE event; pay as you go for food and drinks. RSVP does NOT guarantee entry, so we recommend coming early. If you want to have dinner, we recommend coming even earlier so servers are not trying to talk over our distinguished panelists.